The Knowing Tools™ were designed to help you become aware of intuitive knowledge and information which already ‘exist’ in you. The tools will help you use your inner-knowledge to enhance your creativity, write articles, or develop art and design projects. I have noticed that people are far more knowledgeable than they realise. However, most people are not aware of the knowledge already registered in them, simply because there are distractions around us in our hectic modern life. With so many distractions and information-pollution, people stop listening to themselves, and forget to look at what already lies inside. Once we learn to listen to ourselves, we learn to better locate knowledge and extract it. Just like extracting gold from the earth, we can extract information from the mind, and also see the insights coming from our life experiences. Some people find it easy to listen inwardly, yet most of us find it hard. For that reason, The Knowing Tools were developed, using simple visualisation methods. The tools will help you to clear-out distractions, and to allow for relevant information to surface. You can then use the information creatively and academically, together with the Streaming Knowledge Method (SKM). Key words: Bridge, Cars, Flow, Sky, Clouds, Sun, Message, Feather. Do not focus on any specific car, because that will slow it down, creating a traffic jam or an accident. Simply, observe the ‘thought-cars’ and let then continue moving on the road. Try to de-focus your gaze, so that you look ‘peripherally’ on the flow of all cars, instead of focusing on one-two cars. Now, slowly lift your head up, from the road, and look up to the sky. Once you see the sky in full, notice that the clouds are drifting slowly to all sides. Some are drifting to the right, some to the left; others go straight forward and some go back – to reveal a clear ‘patch’ of blue sky in the middle; just straight above you. Now, in the middle of that clear sky, an image or word starts to show up. This is the knowledge coming to you, in the form of image, word, or maybe even emotions, memories, a feeling. Do not try to ‘read’ the message, rather relax your mind, and let the message ‘sink’ down slowly, from the sky, going down towards you; like feather gently floating down. And as it reaches you allow the message to sink into your pocket or ‘into’ you – hold it in your mind, or heart. Gently open your eyes, and ‘look’ inwardly at the message. Write it down. Now, continue to the Streaming Knowledge Method (SKM). Key words: Memory, Experience, Label, Name. Sit comfortably and think of one happy or important experience that you can remember. When you have the memory, image, or just an emotion in your mind, ask silently that a label will be attached to it. Look at the label, and ask that names will show up on the label. These are names that describe your memory – using words. Now, reach your hands out and ‘hold’ the memory with the label in your hands. Slowly open your eyes, and write the words down on a paper. Now, continue to the Streaming Knowledge Method (SKM). Key words: Colour, Body, Feel, Message. Imagine a colour column in front of you (see illustration below, left side). Then imagine you ‘sit’ behind the column (see illustration below, right side). Each colour now corresponds directly to one part in your body, as you can see in the illustration below. Wait to see what words or feelings coming up from the colour. Do not try to judge or understand it at this point, rather allow it to slowly come up, and expand in front of you. Slowly open your eyes, and write down what you felt or seen, using 2-3 words only. Now, continue to the Streaming Knowledge Method (SKM). 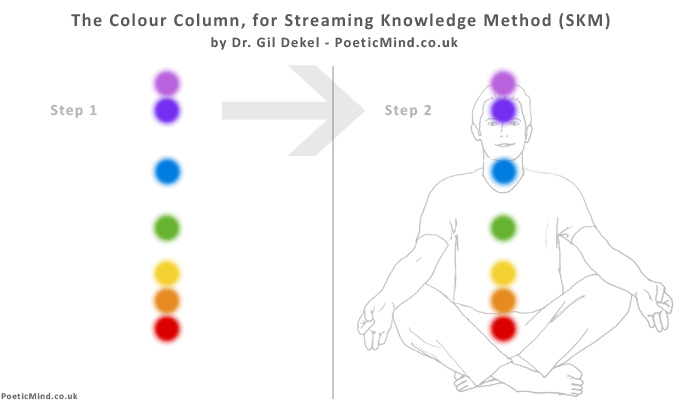 After each of the following visualisations, continue to work with the Streaming Knowledge Method (SKM). Imagine you are in the desert, or on an isolated island. Sea of sand (or water) is all around you. Look gently, and notice mirages of words coming up around you. Imagine you are holding a camera, and start filming a journey inside your head, your heart, and your body. Write down any messages, words, or sensations that come up in each ‘location’. Imagine you are looking through a telescope into space. This space is not the one behind the sky, but rather it is the space of the universe of your mind or heart. Look closely into the ‘galaxies’ of your thoughts and emotions. See what insights lay in each galaxy, or star. Imagine you are a special being, whose body is made of one big bubble-wrap. Now, slowly pop-out all the air bubbles, until your body is now completely ‘popped-out’. With ‘no body’ the only thing that is left of you are thoughts or emotions. Look at the thoughts/emotions. What are they? Write them down. Imagine a clear bright day, and you are at a swimming pool. Swim to the centre of the pool, take a deep breath, and dive in. Now, stand in the centre of the pool, making sure you are inside the water, and that water is covering you. As you stand still, all you can see is clear blue water, with beautiful rays of sun penetrating it. Look at the ‘ripples’ of light that the sun’s rays make in the water, and the gentle bubbles foam it creates. These bubbles move all around you, like a dance. Slowly, words are formed out of the bubbles, and they start move upwards towards the surface. Look at these words, and note them down. * Dr. Dekel has years of experience in teaching creative methods, following his PhD research into conditions that ‘allow’ for inspiration, and practical experience in research methods, writing skills, graphic art, and eastern healing.